From time to time I have had the privilege of looking through a ‘preacher’s Bible’. I am referring to that Bible which has been used by a preacher for many years. They are often easy to pick out among others. One of the first things you might notice is the duck-tape holding the cover together or the rubber bands around the outside to keep notes, bookmarks, and even pages from falling out. Speaking of pages, they are stained along the edges from many years of fingers seeking knowledge of God. You will not hear the crinkle of a ‘new Bible’ here. This Bible has circles and arrows pointing out one verse from another. Some places are underlined and others highlighted. CIA code breakers would have a hard time figuring out the pattern of how verses are marked and referenced. Greek words are scattered everywhere. So many notes can be found in the margins that you might think a whole book could be written from them alone. In fact, some have; Wayne Jackson wrote a book titled Notes from the Margin of My Bible. Thumbing through a Bible such as this is humbling. It becomes a diary and testament to one man’s love for his God. 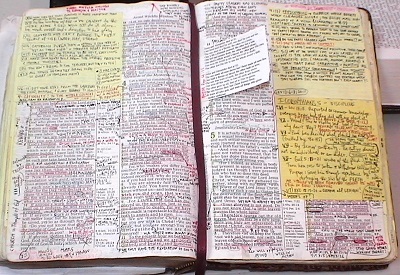 The weight and responsibility of a teacher of God’s word can be felt within the lovingly worn pages. I asked once, “how do you decide what verses to highlight? Are they just special to you or do you have some other pattern?” You see, I was interested so I too could have an impressive looking Bible. How foolish, how selfish of me. This kind, older preacher smiled and then chuckled. He went over to his desk and pulled out a stack of index cards three or four inches thick. They too were stained with age and use. He explained that when he was a young preacher his friend and mentor told him to begin memorizing scripture. “You’ll ne-er regret et”, he mimicked. The handwritten cards helped him memorize and keep scripture fixed in his mind. Only then would he highlight them in his Bible. I swallowed a lump in my throat as I flipped the pages. There was not a single opening without verses highlighted in one color or another, some in colored pencil, others in marker. Here in my hands was a lifetime spent following in the footsteps of the savior. My eyes tear up just contemplating the sacrifices he must have made through the years and the number of souls that will one day be in heaven due to one man’s humble dedication to God. I have fondly recalled all of that to hopefully encourage you in this; teachers, preachers, dads, moms, Christians, we all grow weary from time to time. Life presents us with trials that will test our faith. Sometimes we just seem to run into a case of writer’s block that lasts longer than we hoped, and other times we are afraid to become more for God than who we are now. During those times, might I suggest, if you can, look at an old duck-taped, rubber-banded, circled, arrowed, and edge darkened ‘preacher’s Bible’ and consider that God has blessed us with a great gift…His word, direction, and love, all waiting for us to simply reach out and accept it. You just may be awed at how humbling and inspiring it can be.